A while back I was wandering around in You Tube and came across a beautiful altered book video by a talented young woman called Paveena whose channel is called ‘myautumnsunset’. The book she is showing is absolutely stunning – and I was inspired! One of the things I really liked was the thickness of the pages – she had been able to burrow into them and inlay some found pieces. I didn’t have such a book to hand, nor was I likely to find one. So the idea sat for a while somewhere in the dark recesses of my creative mind. Last Christmas Eldest Daughter had completely surprised me with a wonderful gift – a new ‘Grand Calibur’ die cutting machine. It came in a lovely big, strong box which was sitting under a table in my play room, getting in the way, but with it bound to be handy for something one day, I had refrained from sending it to the recycling station. So that lovely ‘Aha!’ moment arrived – and although I did not cry ‘Eureka!’ and leap from the bath – metaphorically you may say I did! You know where I’m going with this – ‘The box’, I said to Orlando, ‘will perfectly transform into a book….’. So that idea sat for a bit – which is my usual way of working. When I get a new idea I let it sit around, I move it about a bit, imagine the end product – which gives me a kind of over view of how I might get there – sometimes I even jot down a note or two, but nothing much outwardly happens. Then one day I’ll go into the play room and lose busy myself in the creative process. Most often the finished product bears little resemblance to the initial idea – hence the ‘hit or miss’ label I give myself. But something interesting usually transpires. But this task is different. This is everything from a box, I only have one box so can’t muck it up – well not too much anyhow – I have to have a plan, a process, a recipe. I have to think before I leap – or cut – I have to know how it is all going to go together……..
Now this is the part where you get to be very pleased, proud and happy for me – I did it! 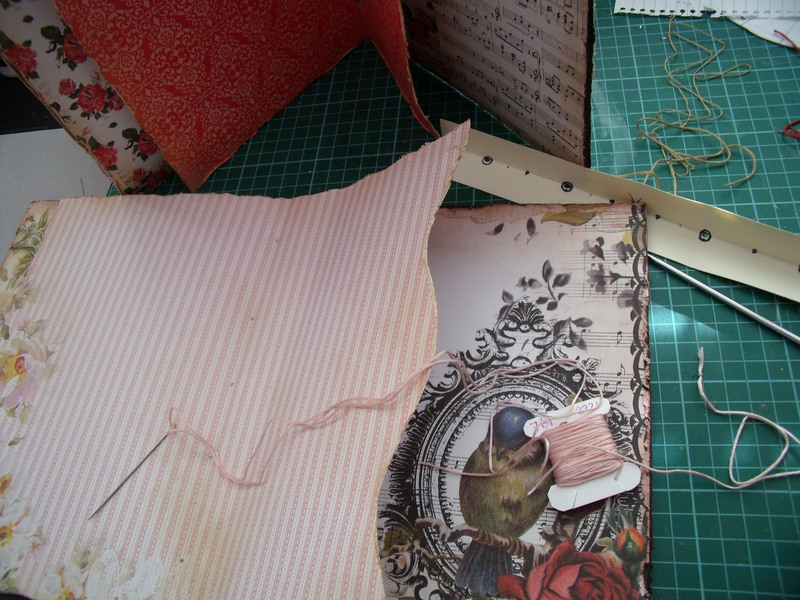 Day 1: Dismantle and cut up the box into page size pieces. Paint all edges black. Tape two ‘pages’ together to make a double page with a slight gap between the two for ease of folding and the later step of sewing the signatures together. Do this three times. Day 2: Choose paper and cut to size. Distress all edges by tearing, razoring [?] and applying ‘Old Paper’ Distress Ink. 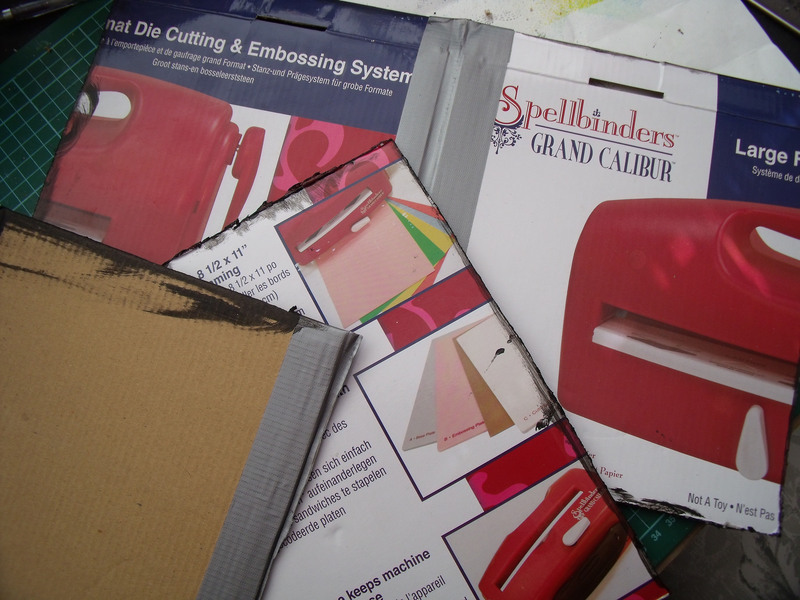 Using tacky glue liberally adhere paper to cardboard pages. A small corner is left to remember it’s provenance! Day 3: Now that the cardboard signatures are ready I made a paper insert for the centre of each one using paper from the same line. These were shaped and the edges were distressed in a similar manner to the cardboard. Then each signature was individually stitched to a pre-measured and pre-spiked length of grunge paper which is to be the inner spine. [Grunge is perfect for this due to its strength and flexibility] I used embroidery floss to sew each signature to ensure the colour matched the paper . 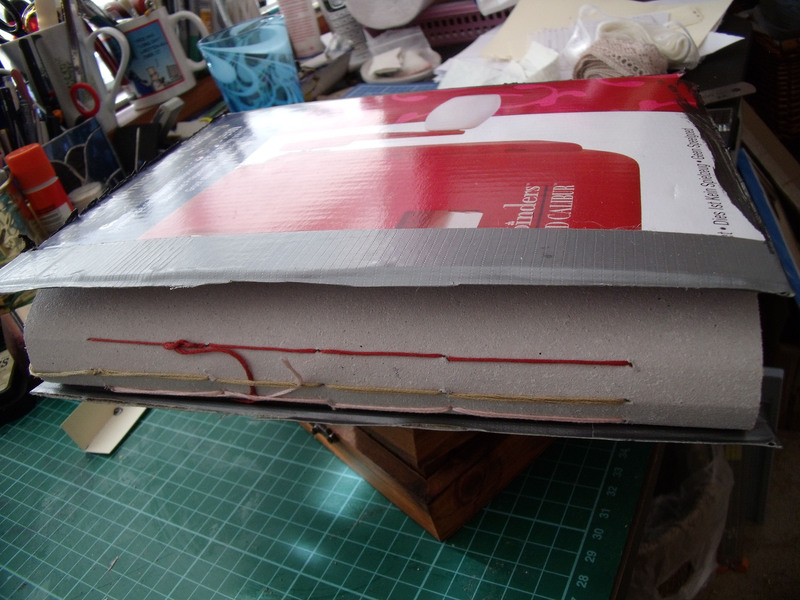 The three signatures sewn to the spine inner with the cardboard cover balanced precariously on top – so you get the idea! Tomorrow I am having a day out with Youngest Daughter which will give me lots of time to brew an answer to the question do I put the cover on next or start decorating the pages? Do I leave the cover til last? Thanks for reading this far, I love that you took the time to pop in. This entry was posted in Uncategorized and tagged Creative Play, Journal Art, Mixed Media, Paper Crafting by thecontentedcrafter. Bookmark the permalink. Came back to see the Genesis of the birthday gift. What a cool and creative thing. You mentioned the word ‘signature’ a fair bit. I wasn’t sure, is that the side of the page? Loved the paper you’re working with too. Happy to spread the knowledge Boomdee 🙂 ‘Signature’ is the name given to the sets of paper that make up a book – generally two or three sheets of paper, folded in half and attached to the spine is one signature. It comes from the old days when books were hand bound and signatures were sewn in. These days mostly glued. Mine are hand stitched. Have a look at your book shelf and you will see the signatures easily if you look at the top of the book. Easier to see on hardbacks. Does that all make sense to you? Thank you for going back and looking Robbie – it really is time to get this project finished – lol!! Argh….love it so much….Like Char, can’t wait to see it completed and ready to fill with your creative awesomeness. [Giggle] Keep fingers crossed, has to be a first time for everything …… too busy reading other peoples blogs at mo to do any actual work myself…. Wow Pauline, it looks amazing so far and I cannot wait to see the finished product. Beaming, waving, cha-cha-cha-ing! Thank you very much kindly! Hi Pauline! I love your project!! Thanks for showing your process. 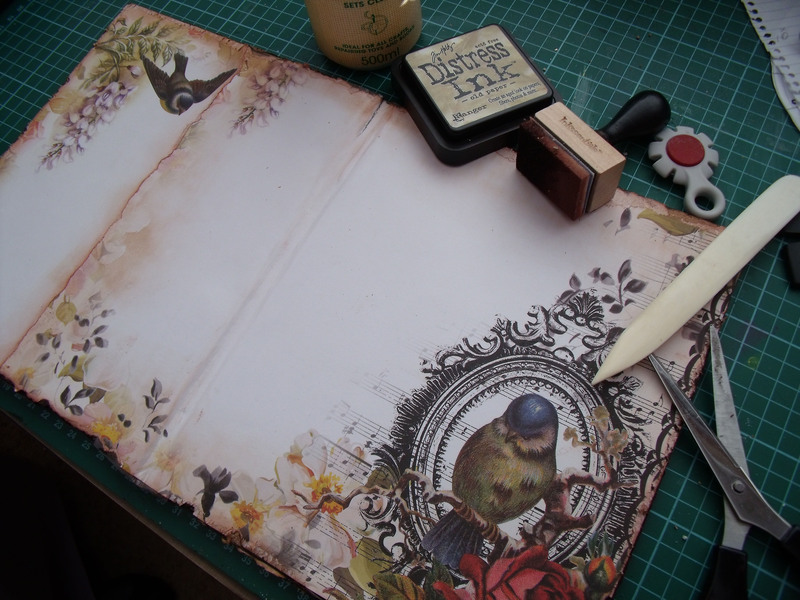 I’ve never made a box book but I just may add it to my list of projects I want to do someday. 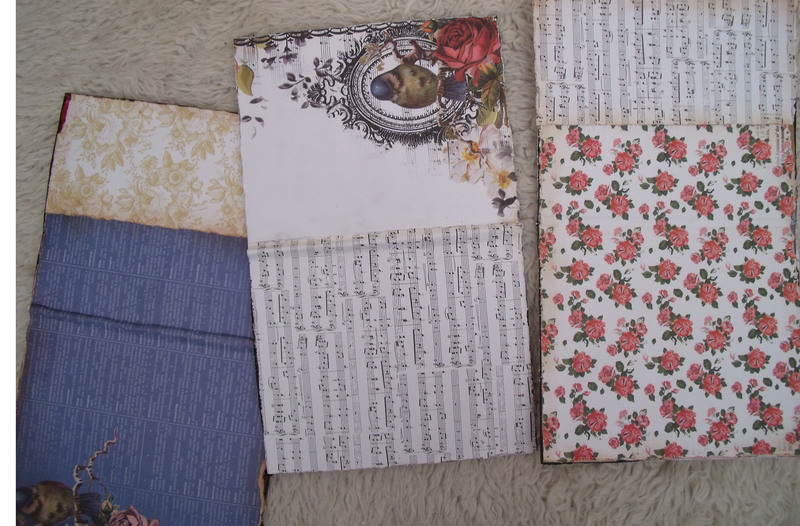 If I were making it now I would probably opt to decorate the pages first and then put it all together. That way you can have full access to your pages without the cover being unwieldy. Have fun and can’t wait to see what’s next! Hi Katy, thanks for taking the time to give your thoughts – I really appreciate hearing from other crafters as I primarily work alone with little feedback. And yes I agree with you – when I got home this afternoon I had a quick peep and many of those creative things mithering around at the back of my daily doings require freedom of movement – so no cover yet. 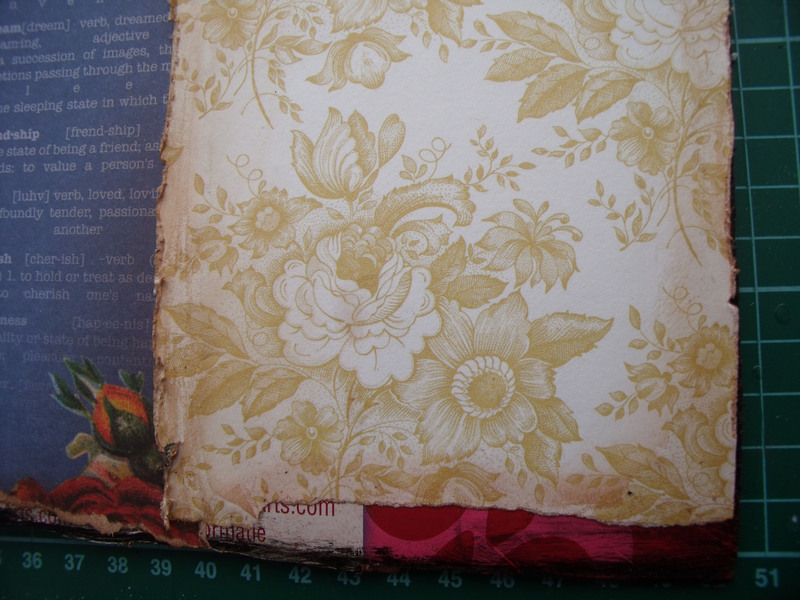 I tea-dyed some lace today……. Pauline, that is very creative. I’m not sire what totell you though. II’ve never done anything like this before. I’m sure it will come out beautiful. I’m impressed, that is awesome! I feel like an idiot, the high point of my day has been Mac and Cheese that didn’t stick together. Giggle! Ah – but you have tons more followers than me – so who’s the really creative blogger?